With LinkedIn’s tool, you can see how you compare in relation to your industry and your own network, as well as which parameters, according to LinkedIn, you need to improve in order to achieve a higher SSI score. Your SSI score is updated daily. You receive an overview of the progress of your SSI score, which for most of us shows that we have just been on summer holiday. At the bottom of the page, you can see how your industry is represented, as well as the average score for your LinkedIn network. See your own SSI score here. Which data does LinkedIn use to calculate Social Selling Index? Have you published Posts on LinkedIn, and how many new followers has this created? Your “acceptance rate” – i.e. how many accept your request to connect. 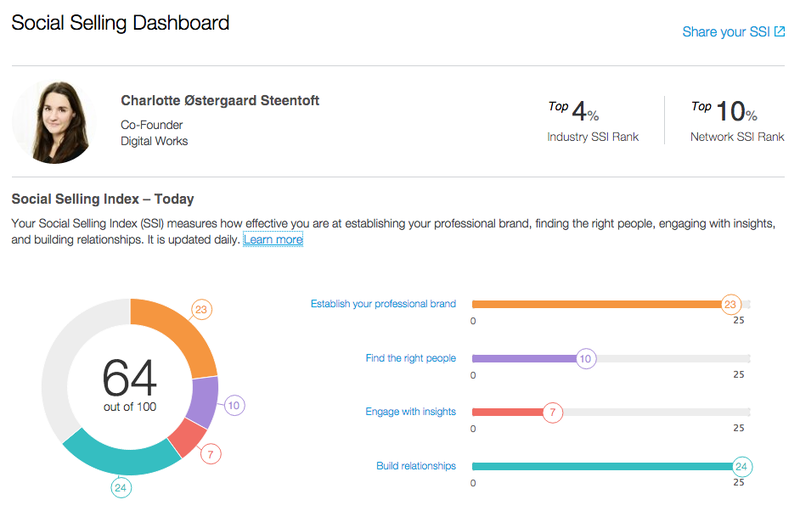 If you use LinkedIn’s Sales Navigator, the figures from here are also calculated into your SSI score. Is SSI a good tool for measuring my Social Selling efforts? Both yes and no. When you look at the amount of data that is taken into account in the SSI calculation, this gives a relatively good picture of your efforts. On the other hand, SSI cannot measure relevance or content. The figures don’t tell us whether you are connecting with the “right” people, or whether the content of your messages includes booking meetings or sending out invitations, or whether the communication is completely irrelevant. In this article we provide suggestions for more in-depth metrics for your Social Selling ROI.